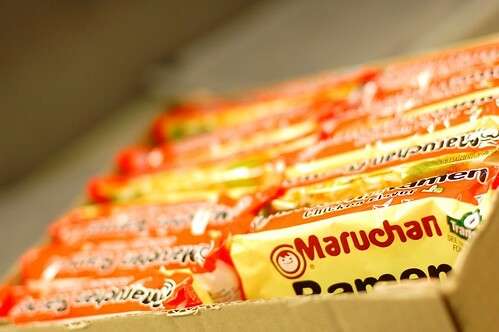 Like many middle-class middle Americans, I first encountered ramen noodles my freshman year of college. They were cheap, more appetizing than most of the cafeteria food, and could be prepared in one pot or, in a pinch, in a electric teakettle. I was vegetarian at the time, so I stocked up on the mushroom and tomato flavors whenever they went on sale – 10-15 cents per meal seemed about right, especially when I was making around $5/hour at my part-time job. It wasn’t until much later that I realized that ramen is meant to be eaten as a soup. See, I’d been boiling the noodles, draining almost all of the liquid, and then tossing the noodles with the sodium – I mean, flavor – packet, just like you do with macaroni and cheese. I didn’t realize that ramen should arrive in a velvety broth, nor that you could – and should – add in meat, vegetables, and basically anything else you like. Thanks to Tampopo and Tomukun, I have seen the error of my ways. I know to concentrate on the three pork slices, and that I should slurp my broth, even if it goes against my dad’s food rules. Tonight was my first attempt at making if not real ramen at home, then at least good ramen. I made a rich broth on Sunday by simmering beef and pork bones with vegetable scraps all day, so that provided the foundation for the soup. Into the warming broth went a handful of homemade pork meatballs, a thinly sliced onion, some ginger, and shaved sunchokes. When the meatballs were just cooked through, I added a packet of ramen noodles – but not the flavor packet. 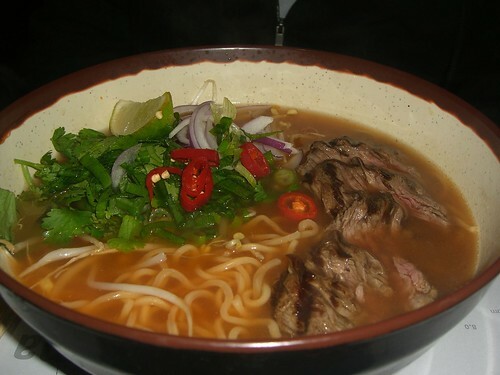 We both added more seasoning at the table – pickapeppa sauce for me, and sriracha for Shane – to give the soup a bit of heat and funk. All in all, a simple and delicious dinner, and one that I anticipate we’ll be making again soon – perhaps with different veg? shrimp instead of/with the meatballs? a fried egg? The options are endless.